Heavy duty performance - Powerful 8.2kW hob burners, twin bulleye reaches 520°C. Versatility - Zonal heat facility on the solid tops. Choice of 4, 6 or 8 burner options for added flexibility. Precise temperature control - Oven controlled by direct acting thermostat. 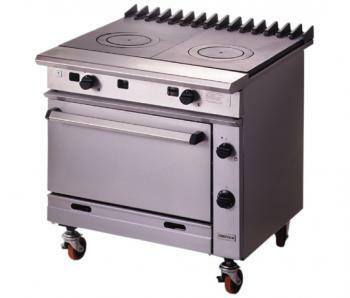 Safe, practical operation - Oven is supplied with anti-tilt shelves and controlled by piezo ignition. All burners have flame failure device. Easy clean hygienic - All stainless steel finish. Oven has removable shelf hangers and easy clean chamber. More products in Oven Ranges.